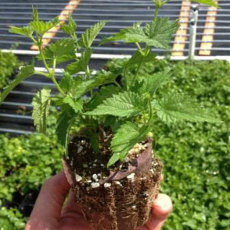 Want to try your hand at growing hops, but a bit scared to start from the ground up with rhizomes? Then hop starter plants are for you! These hop starter plants have already started to grow, and all you need to do is plant them in your garden to finish the job. The varieties we are offering were selected for their growing potential in our hot and humid Indiana summer climate! An already-established hop plant with a higher chance of survival! Get your hop garden started right - with hop plants!